Sega Flash Vol. 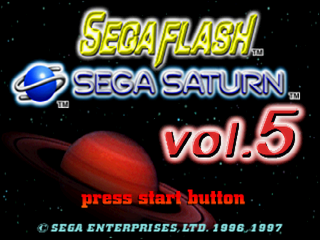 5 is the fifth demo disc in the Sega Flash series. It was released in mid-1997 and features four playable demos; Sonic Jam, Die Hard Arcade, Sonic 3D: Flickies' Island and Sega Rally Championship, as videos containing previews of seven other games. Much of the content is recycled from Sega Flash Vol. 1 and Sega Flash Vol. 4 - the only "new" demo is Sonic Jam, which allows players to play through the first stages of Sonic the Hedgehog and Sonic the Hedgehog 2, as well as a reduced section of Sonic World. As the game had not yet been released in Europe at the time, the game uses Japanese art for its cartridges (the cut-off screen is in Japanese too). All of the extra features are inaccessible. In the United Kingdom this was released with issue #23 of Sega Saturn Magazine. It was also distributed with consoles.